Today’s post wraps up the three part series that the marvellous Rick Alexander has kindly written – thanks Rick. The first post was on getting your set-up right for recording. And the second was on microphone positioning. In this final post of this series Rick talks about USB audio interfaces and audio software. You need an audio interface to convert the analog signal from the mic to digital. Sometimes this conversion job will be done in the mic itself (as in USB mics which have a USB output). But the most common solution is to use an audio interface box which has microphone inputs and a USB connection to a computer or tablet. For playback, audio interfaces also have audio outputs for connecting to an amplifier and speakers, plus a headphone output. You can get audio interfaces with varying numbers of microphone inputs from one upwards. Two mic inputs are common and I’d recommend this combination so you can do stereo recording. Recently audio interfaces which work with a tablet have come out. Recording to a tablet rather than computer has the advantage that the tablet won’t generate fan or hard disk noise. Most audio interfaces will record a variety of bit depths and sampling rates. For the audio examples in this series I recorded with 24 bits per sample, 44100 samples per second. It’s worth adjusting the input level control of the audio interface so that your recorded signal is close to full scale. I.e. you don’t want to be scaling up the signal too much after it’s been recorded. 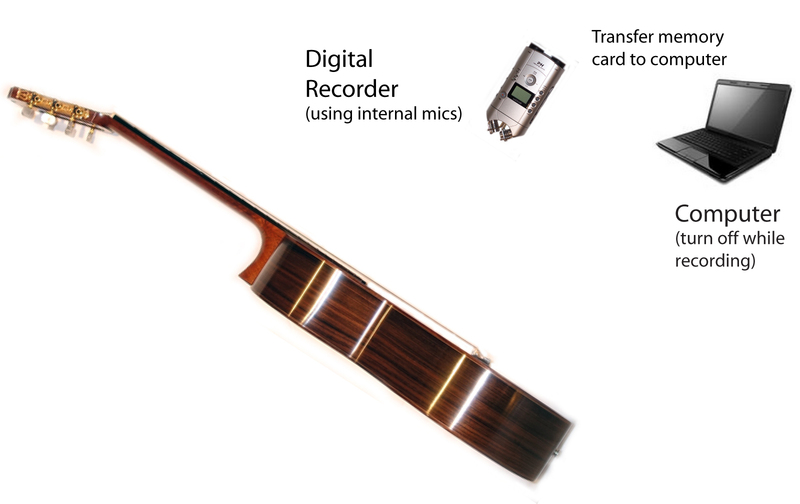 An alternative to using an audio interface and computer is to use a stand-alone digital recorder to record (Figure 1) with the option of connecting external microphones for better sound quality (Figure 2). Also the computer can be turned off while recording so, as with recording to a tablet, you don’t need to worry about recording fan or hard disk noise. For my home recording I mostly use a computer based setup but I also used a Zoom H4 recorder with external KM184 microphones for two tracks on my latest CD. A digital recorder is a useful part of your recording setup. For example, to test microphones you could take a digital recorder along to the store. I’ve taken my Zoom H4 along when testing guitars so I could compare the sound of various guitars later. Also, the Zoom H5 recorder can also be used directly as a USB audio interface. I.e. you can record via USB straight to a computer rather than the memory card in the recorder. You’ll need audio software running on your computer or tablet. Audio interfaces often come with bundled software or alternatively you can get separate software which will work with any interface. A free example for stereo or multi-track recording is Audacity http://audacity.sourceforge.net/ . A cheap but fully featured multi-track recording program is Reaper: http://www.reaper.fm/ ($US 60 for non-commercial use.) I use Sony Sound Forge for solo recording and Reaper for recording overdubbed duets. Up to this point we have a raw recording. The next steps in producing a finished track are to do some editing, possibly perform equalisation (EQ) to alter the frequency content, maybe apply dynamic range compression and add reverb. I think that for a classical guitar recording performing the least EQ and compression is generally best. This is because ideally we want the guitar to sound 100% natural. But, unless you live in a concert hall, you’ll want to add reverb to a home recording. This can be done using audio software such as Audacity, Reaper or Sound Forge. My final example audio is the stereo example with angled mics from part 2 of this series with a little reverb added using Sony Sound Forge’s “Acoustic Mirror” reverb. The Acoustic Mirror reverb in Sound Forge adds the reverb recorded from a real acoustic space to your recording. They provide a number of acoustic spaces with the program and here I’ve used a Masonic Centre at Madison, Wisconsin, USA. Here’s the raw track again. And here’s the same track with reverb added. You can gain a lot of enjoyment from home recording. It adds another dimension to your playing and is simply a lot of fun. And these days it doesn’t have to be too expensive. I hope this series helps you, and if you have any questions feel free to post a comment. Thank you for the opportunity to write this series Nicole! Hi folks, following on from the first in a three part guest post from Rick Alexander (here’s the LINK in case you missed it) on how to approach a recording set-up, I have a fabulous post for you from Rick on microphone positioning for optimum sound capture during the recording process. Microphone positioning is one area where recording becomes more of an art than a science. You do need to experiment in order to get the best results. Figure 1 above shows a typical setup for stereo recording (see more on stereo vs mono below). Pointing one mic at the bridge, one mic at the 12th fret works well. As noted in part 1, you won’t want the mics too close to the guitar or you’ll get too much bass. I usually have around 25 to 35cm from the mic tip to the guitar. If you have the mics further away you’ll be picking up more and more of the sound reflections from your room’s walls and floor. Unless your room is acoustically optimised you probably don’t want this. Also, an advantage of having the microphones fairly close to the guitar is that this will help the guitar’s sound to outweigh any sound from traffic etc. from outside. Here is a stereo recording I’ve made with the setup shown in Figure 1. The microphones I used are Neumann KM184s and the audio interface a MOTU 828 mk3. The guitar is a 1995 Carson Crickmore with a traditionally braced spruce top. The strings are Hannabach high tension Silver Special basses and Carbon trebles (which are fairly bright). The music is the introduction of my piece “Bellbrae” from my CD “Fine Light”. I’ve put the right mic signal, from the listener’s point of view, on the right channel and the left mic on the left channel. (Putting each mic’s signal totally on one channel gives the widest stereo image.) Note that this is a raw recording – I’ve done no adjustment except to adjust the levels of the left and right signals to about the same level and to fade the ending. 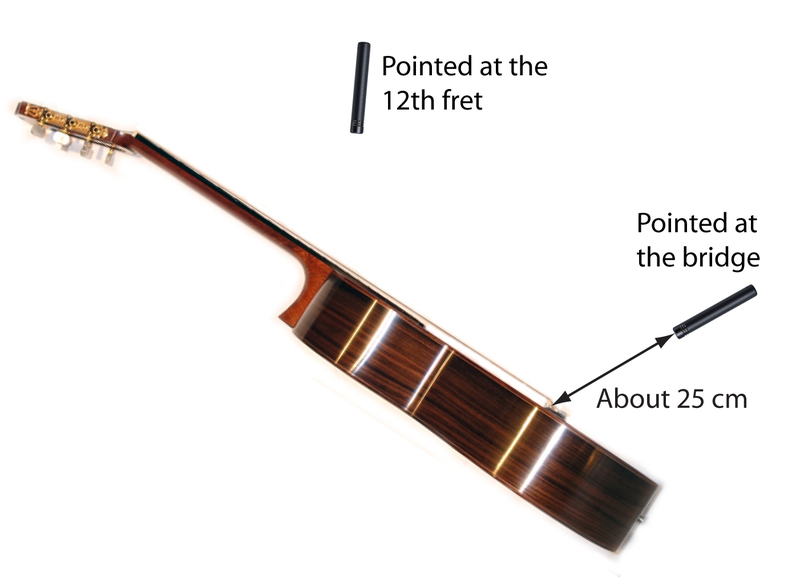 I sometimes put the mics perpendicular to the sound board of the guitar as in Figure 1. 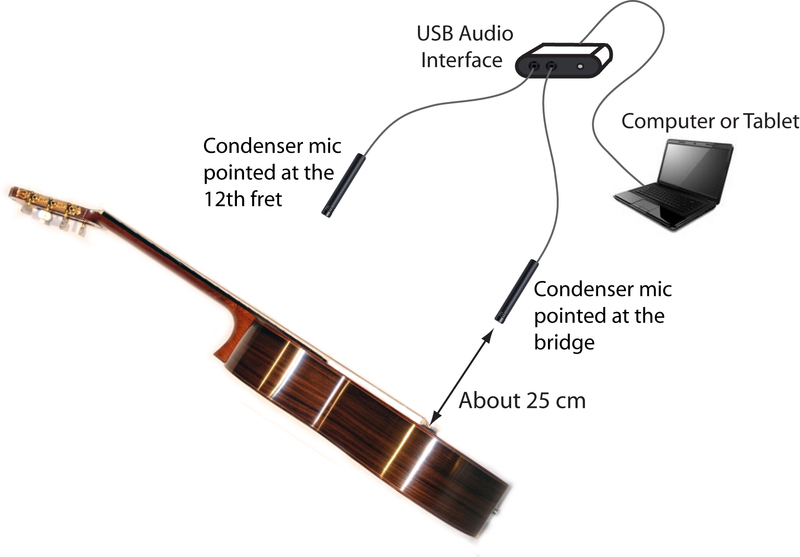 Alternatively, I angle the mics as in Figure 2, with the mics about 25cm from the guitar. Audio Example 2 is a recording I’ve made with the mics setup as in Figure 2. I prefer the sound of example 2 but the difference isn’t large. It’s also worthwhile experimenting with which strings you point at. I usually aim the mic roughly at the 3rd and 4th strings. You don’t need to be too precise but, for example, I think you’d start noticing too much bass if you aimed as far off centre as the 6th string. If you have a hard wooden floor I’d recommend putting a rug under yourself and the mic stands in order to reduce the guitar sound reflecting from the floor to the mics. Finally, if you’re recording using a computer I’d suggest setting up so that you can point the back of the mics in the direction of the computer so as to reduce the level of computer noise recorded. You might well ask: why stereo? We only want to record one guitar after all. Also, you’ll often see concert performers only using one mic on their guitar. But you’ll find that if you record a single guitar in stereo you’ll get a much more realistic sounding result. Especially when listening on headphones. Audio Example 3 here illustrates the difference. The example has a short section of audio in mono then a short section in stereo followed by longer mono and stereo sections. I’ve used the setup in Figure 2 for the stereo section and the mono section is just the right channel from the stereo recording. I did also try using the bridge mic for this mono example but thought the neck mic sounded better. K & M make good quality mic stands. 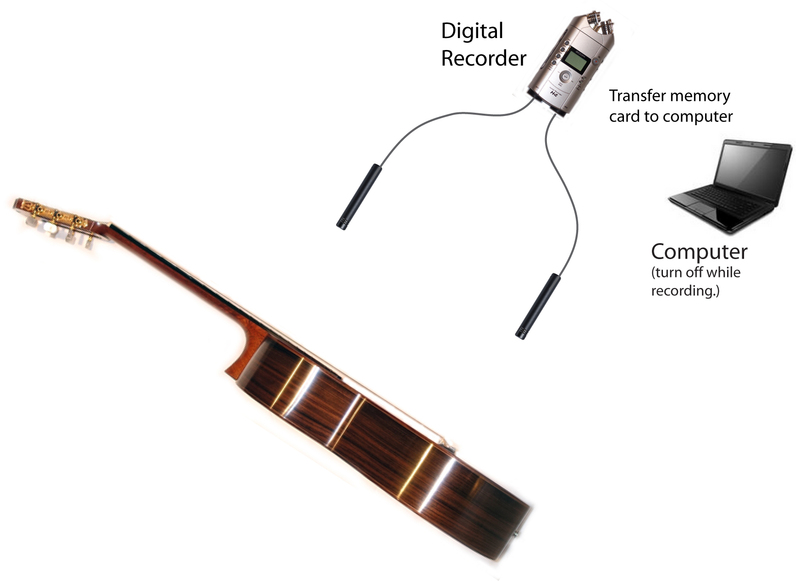 They have a small stand, K&M 25950, which is particularly useful for classical guitar recording. http://www.sweetwater.com/store/detail/KM25950 Using this stand lets you avoid having the large boom of a typical mic stand cluttering up your room. In the next post I’ll discuss options for the audio interface used to interface the microphones to your computer.